Born in Ghent, Belgium, 25 April 1961. He is married to Lena Clarke and has three children. Enjoys football, small PC applications and gastronomy. Frank De Winne graduated from the Royal School of Cadets, Lier, in 1979. He received a Masters degree in telecommunications and civil engineering from the Royal Military Academy, Brussels, in 1984. He was awarded the AIA Prize for the best thesis. In 1991, he completed the Staff Course at the Defence College in Brussels, gaining the highest distinction. In 1992, he graduated from the Empire Test Pilots School (ETPS) in Boscombe Down, UK, where he was awarded the McKenna Trophy. Chairman of the Forum Space and Education. Goodwill Ambassador for UNICEF Belgium. First non-American pilot to receive the Joe Bill Dryden Semper Viper Award, in 1997, for demonstrating exceptional skills during a flight. Appointed ‘Officier in de Orde van Oranje Nassau’ by the Dutch Queen for showing leadership during operation Allied Force (July 1999). He was awarded the ‘Medal of Friendship’ by the Russian Federation. In 2003, De Winne received an honorary doctorate from the University of Limburg. After completing his pilot training with the Belgian Air Force, in 1986, Frank De Winne was an operational pilot on Mirage V aircraft. Detached to the SAGEM company in Paris in 1989, he then worked in the Mirage Safety Improvement Programme, where he was responsible for the preparing the operational and technical specifications. In December 1992, he was appointed to the Test and Evaluation branch of the Belgian Air Force. As a test pilot, he was involved in various activities, such as CARAPACE (an electronic warfare programme on the F16) at Eglin Air Force Base, USA, and a Self-Protection Programme for the C130 aircraft. During that period, he also flew from Gosselies in Charleroi, Belgium, as a reception pilot in different types of aircraft. Frank De Winne has logged more than 2300 hours flying time on several types of high-performance aircraft, including Mirage, F16, Jaguar and Tornado. 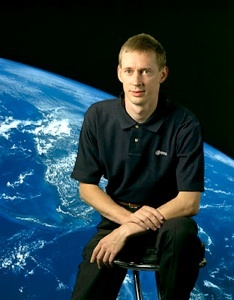 In January 2000, Frank De Winne joined the European Astronaut Corps of the European Space Agency, whose homebase is the European Astronaut Centre in Cologne, Germany. He provided technical support for the X38 Crew Return Vehicle project division within the Directorate of Manned Spaceflight and Microgravity, located at ESA’s research and technology centre, ESTEC, in Noordwijk, the Netherlands. In August 2001, De Winne took up training at the Gagarin Cosmonaut Training Centre (GCTC/Star City) near Moscow, Russia. Training included elements of Basic Training for the International Space Station (ISS) as well as training as a Soyuz flight engineer. From 30 October to 10 November 2002, De Winne participated in the Odissea mission, a support flight to the ISS. He served as flight engineer on the updated Soyuz TMA spacecraft during ascent, and on Soyuz TM during reentry. A prime task of the 11-day mission was the replacement of the Soyuz TM-34 vehicle attached to the ISS by the new Soyuz TMA-1 spacecraft, in order to deliver a fresh lifeboat for the resident crew to be used in case of an emergency. During his nine days on the ISS, De Winne, whose flight was sponsored by the Belgian Federal Office for Scientific, Technical and Cultural Affairs (OSTC), carried out a programme of 23 experiments in the fields of life and physical sciences and education, including experiments in an important new research facility designed and developed in Europe, the Microgravity Science Glovebox (MSG). After his spaceflight, Frank De Winne supported the Directorate of Human Spaceflight, Mircrogravity and Exploration with various tasks. His activities focused on supporting development and qualification of the European Columbus laboratory and participating in the establishment of the ‘White Paper on European Space Policy’ with the European Commission. In 2005, Frank De Winne started preparing as backup for ESA astronaut Léopold Eyharts for the ISS mission to deliver and commission the Columbus laboratory. Frank De Winne is currently assigned as flight engineer for ISS Expedition 20 and as commander for ISS Expedition 21.